Welcome Readers and #RaRaLinkup Friends! So glad that you are here today. Another version uses the word “receive” in place of “welcome”. Now, of course I’m excited about this baby, but am I adjusting my home, schedule and life to welcome this little one? Am I filling my calendar as usual or slowing to prepare for what’s coming? Am I driving, full speed ahead, or yielding to what’s approaching? You might not be pregnant with a child, but you might be pregnant with an idea, a task or a calling that requires you to make adjustments in your life. You might have been entrusted with something yet aren’t stewarding it well. You might have been entrusted with someone yet you are avoiding them. Are you welcoming what has been brought to your doorstep or going about business as usual? When we welcome what Jesus brings into our lives it’s like we are welcoming Him right in. Receiving those around us paves the way for growth. It is not often convenient but it develops our character and demonstrates our love for others and Christ. I multi-task a lot and it doesn’t usually go well for me. It stirs up frustration, distraction and short-fused reactions. This year I have been trying to listen more. Within the last week His Spirit has whispered twice, Leave your book in the car. Go with open hands as you meet with that person. I want to live with hands that are ready to welcome what God brings. I want to have open palms to receive what He thinks is best. Trust is required to live this way. Surrender is needed to lay down what I’m gripping so that I can take His hand and let Him lead. Do we bypass friendships because we want to be included with the “in-crowd”? Do we forfeit His best because we are convinced the good is what will fulfill us? Do we slam the door on humble invitations because we crave the fanfare that important opportunities offer? What is on the doorstep of your life right now? Are you making room in your heart and schedule to welcome who is coming? Are you making adjustments to receive what He is giving? Has God brought you a small jewel but you have overlooked it on your way to the big house full of gold? Has He redirected your steps, down a winding path, but you insist on taking the wide road that feels familiar? Has He wrapped up a peculiar treasure in the bow of suffering, but you feel entitled to the make-life-easier gadget found on your gift registry? Let’s not neglect the small. Let’s not turn away from the tiny. Let’s not make light of the little. I dare say, in God’s economy, the small is really the big after all—the least are the greatest, the poor in spirit are blessed, the weak made strong, the lost are found. Embrace what He has brought to your doorstep, with open hands. Make room for the small—for it is much indeed. Add your encouraging post to the #RaRaLinkup below! Ah Katie, I miss the “slow” of my childhood. My neighbors and grandparents used to drop by all the time. We sat on the porch or played in the yard and talked to people walking their dogs or riding bikes. It’s not that we don’t do some of that now, but everything seems to contrived, so rushed. I remember the first time another mom asked if I wanted to schedule a “play date”. What?!? I’m still getting used to it all. My husband and I have discussed working hard to get to know our neighbors better this year. Thank you for this important piece! HI Meg: Ah yes the “slow” of childhood. I don’t want to lose that, yet I rush so often. Great idea to get to know your neighbors more, we need to do this too. Happy Tuesday Meg! Katie, this is so, so good. For our 22 years of marriage, we’ve gone down to my in-laws’ house in the country in south Alabama for visits. That’s exactly what everyone does where they live! They just pop in for visits unannounced. Things are so unrushed there. They take time to enjoy one another. I’ve always loved that about it, such a refreshing change. You make such an important point here. Yes, we need to embrace that which is right in front of us. I agree with you too – the small is BIG in God’s economy:) Love love love this post! Katie, thanks so much for your thought-provoking words today. I need to read this a few times to really think about what “small things” I’m missing, what small beginning’s I’m overlooking or despising. (That verse from Zechariah comes to mind.) No to multi-tasking is a big one for me, and so it making room in my life for God’s calling. May the Lord bless you as you make room for the coming of your little one. So exciting. Hi Betsy! Love that verse in Zechariah, it’s convicting for sure. “Make room in life for His calling”, yes and amen. Katie, it’s great to visit your site today and to hear your words which resonate with the question that God has been whispering to me this year: What’s your hurry? I am committed to the stay-in-the-moment love for my boys this year, and trusting God for grace to slow down, to uni-task more, and to be more present in the present. I appreciate your good thoughts here! Hi Michele: “What’s your hurry?” What an important question. I want to remember that! Thank you for this truth today. As you asked each question, I was answering for myself and even though the “small” that I need to embrace does not look like yours, I still have one. When we embrace the small that God has given us, we are drawing close to Him. That is where I desire to be but forget in the busy that I create around me. Beautiful reminder, Katie! Thank you for the linkup. Congrats on the upcoming addition to your family! We are expecting our fourth girl this April, and are incredibly excited. Thank you for the reminder to welcome with open arms, the many incredible gifts that God sends our way. Wishing you an your family a blessed week! Thank you. Yes, let’s live with open arms, I don’t think we’ll regret that. Thank you Brenda- glad you’re here! Katie, I love this! I am constantly in awe in how much the small means to the Lord. I pray I am willing to die to my flesh and stop my own plan for the sake of His every day. I don’t want to miss one little thing. Praising God for this new life for you!! First, congratulations! Oh, there is no sweeter gift than a tiny, pink newborn. This little surprise will be such a blessing to you! And I too long for days where we could just drop by and where I’d be okay with setting aside my plans. Good stuff. Thank you for hosting the linkup! You are welcome Lisa! Thanks for being here. Well that one question just stood up and smacked me… and I find myself asking, “if I have the Almighty God willing to start me on a new path, designed just for me, why in the world would I drag my feet or question all the little things adding up to something much bigger in Him?” As if I know anything about anything, lol. 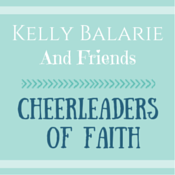 So grateful for this post today, Katie… it’s really spoken to my heart this morning. Yes, let’s embrace the unexpected. I need to remember to do that more too, Katie! Hi Tara: Hope you are enjoying your Tuesday. Embracing the unexpected is hard, eh? It takes trust and a willingness to follow—not easy but possible with His help. I love this, Katie. I’m not so good at the unexpected or the hard where I have to step out of my comfort zone, so I need this reminder. I want to embrace whatever God has in store for me. To trust Him that He knows what’s best and will give the strength necessary. To surrender my tightly-clenched fists to Him, to open them wide to His plans. I hope all goes well with you and your baby. Blessings and hugs to you both! Hi Trudy: “To surrender tightly-clenched fists to Him, to open them wide to His plans”- help us to do this Lord. HI Sue: Yes, let’s lay down the extra, unnecessary stuff we grasp for so that we can receive from our Good Father. This is something God is speaking to me more and more these days. It’s not about the fanfare and the big numbers. It’s about the heart. Thank you for this beautiful message, Katie. Thank you for reminding me of how God uses the small more than anything. Hi Holly: So glad you are here and glad God spoke to you. I often minimize the small. It’s easy to forget—in our “bigger is better” culture—that Jesus’ economy is so different from ours. Katie, what a beautiful post. Congratulations on the coming of your daughter! 🙂 And thanks for the exhortation to make room for the changes that come, that God allows. Those uninvited guests, like a torn ACL and the resulting surgery, have definitely been unexpected guests in my life. My attitude has been, “Let’s get through this so I can get back to normal.” I may need to re-think this and truly begin looking for those gems God has for me in this season. HI Jeanne: Sorry about your torn ACL, but you’re right, so often we want to hurry up and get on with things when really the unexpected thing might be just where we need to linger for awhile. Wonderful post, Katie. As I read, it brought to mind (and I opened to), “Do not despise these small beginnings, for the Lord rejoices to see the work begin.” (Zechariah 4:10, NLT). I think I have often heard the beginning of that verse but not what follows the comma – “for the Lord rejoices to see the work begin.” Amazing to think of our God rejoicing in the work beginning. The very start of the work brings Him joy. May we start that which He places before us – no matter how small it may seem to us. Thank you, I needed to think on that today. Blessings! HI Joanne: I’m smiling because our daughter’s middle name is going to be “joy”. Yes, love that verse and appreciate your insights on it! HI Angela: This is good, “Valuing the person right in front of you is so important and we miss that when we resent the interruption.” God, help us to value what you do! “I want to live with hands that are ready to welcome what God brings.” There’s something so beautiful about being ready to receive what God has, even if it’s entirely different than what we expect. I’ve had a few times when I turned my back on unexpected offerings, and I regret doing so. But that regret has taught me to live wide-open and watch for God to move. Thanks for the reminder today, Katie. Hi Tiffany: It’s easy to miss it when we aren’t expecting it, isn’t it? So glad for His grace when we don’t get it right and for the motivation to grow because of regret. Ahhh the bow of suffering…just when I was looking for the “easy” button. Thank you for your words of truth here and thank you for taking the time to welcome my friend Lisa to this wonderful blogging community. Not a bow we like to untie, eh Bev? Hope you are doing well as you press on and in, with Christ. 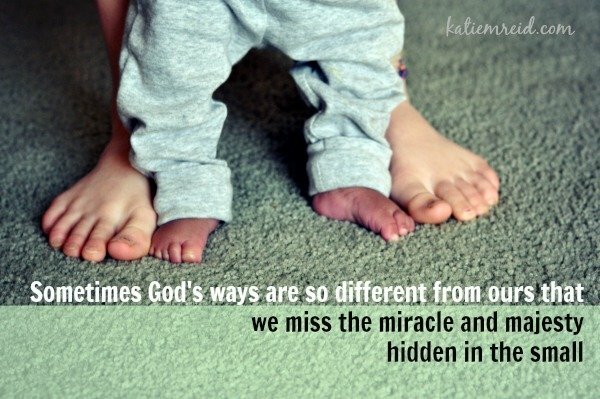 “Sometimes God’s ways are so different from ours that we miss the miracle and majesty hidden in the small” That is so true, Katie. I, too, want to be open to what God has for me. I want to be ready to welcome the small. Thank you for this lovely post!